Animals (and books, bridges, and hats!) are a part of our everyday life. But do we think of them when we think of great art? Here are picture books for students of all ages…Students can examine the paintings from so many different angles: Different colors, shapes, sizes…Some where the topics are only small parts of the painting, some where they are the focus of the painting. They can look through these paintings that span many centuries, and notice the similarities and the differences between them…See the colors, the textures and patterns, and more. There are currently DOZENS of books in our “Enjoying Great Art Series” now available as pdf downloads on CurrClick: In Art: Animals, In Art: Books, In Art: Bridges, and In Art: Hats. If you would prefer not to have to print the pages, they are also each available as full-color paperbacks on Amazon. 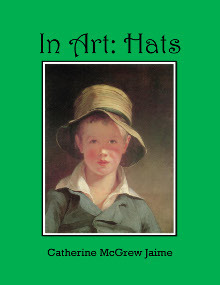 The first four of many titles were: In Art: Animals, In Art: Books, In Art: Bridges, and In Art: Hats. And on www.GameCrafter.com you can find decks of 40 art cards that go with the first books: Animals in Art, Books in Art, Bridges in Art, and Hats in Art. Have a wonderful, art-filled day!